Cambodia's recent tumultuous past has had an obvious effect on its true beauty and incredible history. This is all changing and in recent years, Cambodia has seen a hike in tourist numbers and the adventuresome traveller is once again experiencing a Cambodia of yesteryear. 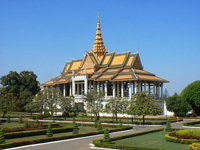 After arriving in Phnom Penh you’ll begin your exciting adventure with tours to visit the impressive Khmer-style Royal Palace complex which was built in 1866. You’ll also spend time visiting the Silver Pagoda (Emerald Buddha Temple), the Independence Monument (to commemorate the Cambodians taking their country back from the French), the National Museum and the Toul Sleng Prision, now the Genocide Museum. The Toul Sleng prison was once one of the Khmer Rouge’s biggest secrets and was specifically designed to interrogate and exterminate detainees. Whilst in Phnom Penh you will also have time to visit Wat Phnom and take a leisurely walk along the banks of the Mekong River. Phnom Penh is a lovely city, which comes to life at night, so be sure to venture out after dark. Leaving Phnom Penh behind we take an internal flight to Siem Reap – the home of Angkor Wat! After settling into your accommodation we’ll begin your sightseeing with a visit to the Angkor National Museum. The museum uses state of the art technology to take you back in time to the Ancient Khmer civilisation and see the temples and city of Angkor Thom at their height. 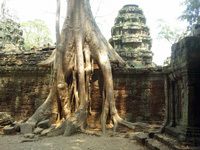 Following the museum tour we begin exploring the modern day ruins of Angkor starting with Ta Prohm (Tomb Raider Temple) which seems to be held together by enormous fig tree roots which have wrapped and entwined their way through the temple, giving a very mysterious and magical feeling. 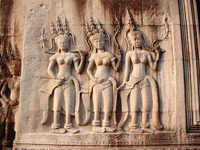 We’ll also visit Prasat Kravan, Srah Srang (the royal baths), Banteay Kdei, Thommanon and Chaosay Tevorda Temples. In total you will have 3 days to explore the Temples of Angkor in full, one of these days will include a bicycle tour which will allow you to escape the tourist crowds and visit some of the lesser known temples. The crown in the glory of Angkor is of course, Angkor Wat and we’ll ensure you have plenty of time to explore the temple and take some amazing photo’s. 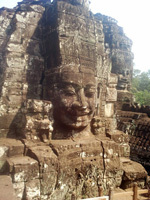 Before leaving Siem Reap you have 2 more days of tours. The first is to visit the Rolous Group of Temples which were the seat of the Hariharalaya and the first capital of of the Khmer Empire north of Tonle Sap. Among the Rolous Temples, you’ll see some of the earliest permanent structures built by the Khmer Empire. The final tour from Siem Reap is to visit the ‘floating villages’ at Tonle Sap. A short drive from the centre of Siem Reap lies the massive Tonle Sap Lake – the largest freshwater lake in South East Asia - In the rainy season the lake covers a huge 12,000 km². Whilst here you’ll take a boat trip through one of the local fishing villages, where the houses appear to float on the water. If you visit the area during the dry season, you’ll see that rather than the houses floating, they are actually built on stilts around 10m (or more!) up in the air. You’ll see the local people going about their daily business and also take a locally made wooden boat through the mangroves. Leaving Angkor and Siem Reap behind you take an internal flight to Phnom Penh, the countries capital. Whilst in Phnom Penh you’ll take another boat trip to visit Koh Dach – Silk Island, where you’ll see the silk weaving processes in practise and experience the realities of local village life. Another tour whilst in Phnom Penh is to the Choeung Ek museum, where approximately 17,000 men, women, children and infants were detailed and tortured between 1975 and 1978. Your Cambodian adventure ends with some relaxation time on the beach in the coastal town of Kep.